From a PR standpoint this is not a good time to be a drone. Most mentions of drones in the media are not particularly flattering. You hear about military drones, predator drones, pepper-spray-bullet drones--yes, really--and drones used by creepy guys. Any mention of the word drone is usually followed by the potential threats drones pose to our safety and our privacy. It could really hurt someone's feelings... if drones were capable of having feelings, I suppose. 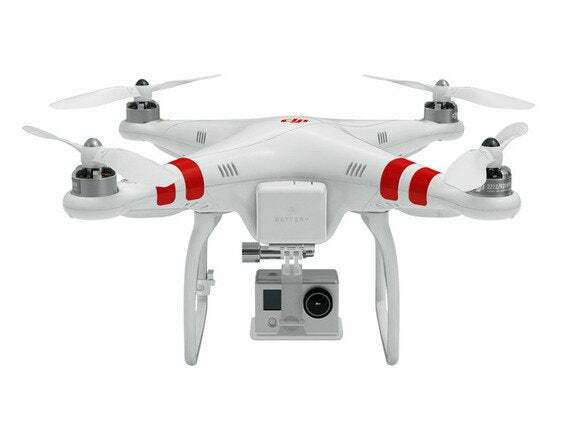 DJI’s Phantom is designed for aerial filming. But it turns out that drones have a software side, too. And it's not just because design maven Martha Stewart has been posting pictures of her Connecticut farm taken by a DJI Phantom drone. Even with regulations limiting commercial drone use in the US and elsewhere, hobbyists, scientists, videographers and others have discovered numerous ways for drones to do good, save lives and make the world a happier place. Here are five great examples. Because they can go where most people can't, drones can help give us a view we normally couldn't enjoy. And that enables new ways to learn, understand, and express ourselves. Take a DJI Phantom--available for less than $1500--fit it with a GoPro camera, and set it loose in the skies above Manhattan, and you'll get an appreciation for how drones can enhance your outlook on things. But it's not just amazing surfing videos or footage shot from within a fireworks spectacular: drones can also give us a different view on something as complex as how the New York Public Library routes millions of books, DVDs and other media across its 150 branches. A Phantom 2 quadcopter drone carrying a GoPro Hero 3 recorded this video of the library's massive routing facility. UCLA's football program has also turned to drones. Coaches are using camera-equipped drones during practice for a view of the action along the line of scrimmage. UCLA's coaches think the view will give them information players' footwork and speed. It's easy to see a future where drones move from the practice field to the games themselves, offering fans a new way to experience the action. Forget shots from the Goodyear blimp: give us a dozen drones streaming views from every angle. Traveling to remote parts of the globe can be thrilling; it can also be costly. Riding along, virtually, with a drone, can help you see places you might not otherwise get to visit, and you don't even have to update your pasport. Travel By Drone crowdsources drone videos from around the world, offering a unique view of the places you may someday get a chance to visit for real. 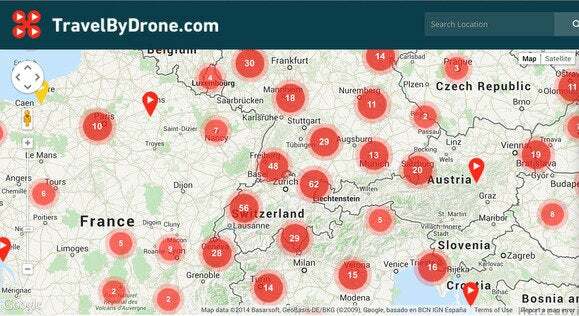 This map, at TravelByDrone.com, shows some of the European locales where you can fly along with a drone for another perspective on an area. If you're looking for examples of travel-by-drone done right, this video of a historic manor house north of Oxford in the UK provides some breath-taking views, even if they are meant to sell real estate. But we also like this drone's eye view of Brigit's Garden near Galway, Ireland. It's easy to point at Jeff Bezos's advocacy of delivery drones and joke that the Amazon CEO may be a comic book supervillain or to have a good laugh at the prospect of the TacoCopter and its promise of immediate, airborne taco goodness. But make no mistake: delivery by drone is probably inevitable, despite current restrictions. Amazon has petitioned the FAA to let the company test its "Prime Air" drone delivery service outside the government's six approved test sites, none of which are located near Amazon's Seattle headquarters. According to the online giant, its delivery drones can fly 50 mph and carry packages weighing up to 5 pounds. About 85 percent of all products sold through Amazon weight less than that. Should the FAA consent, Amazon promises its delivery drones will be ready for action by 2015. While we wait to see if Amazon wins the FAA's OK, there are more fanciful examples of drone delivery to consider. If 30 minutes is much too long to wait for a pizza, for example, Domino's wants to whet your appetite with the DomiCopter. It's a pure PR stunt, though a good one. And as great as speedy delivery would be, how about a drone that not only brings you a drink, but makes it as well? The Yura is an experimental bartender drone concept that mixes your favorite drink and then flies it to you. Yura is just an experiment at this point, but a drone that mixes you a drink and then flies it over to you is part of a future that we want to live in. It's safe to say that there are some parts of the world that are better off if people never set foot there--even well-intentioned people. Enter drones, which can help with conservation efforts with minimal disruption for the local flora and fauna. In Hawaii, scientists are using drones to assess the local ecosystem without harming any fragile areas. A team from the National Oceanic and Atmospheric Administration (NOAA) and the US Fish & Wildlife Service surveyed monk seals, sea turtles, and vegetation and examined marine debris in the Papahanaumokuakea Marine National Monument. And the NOAA's Southwest Fisheries Science Center also uses drones to monitor sperm whale activity. Drones also help fight forest fires. Last year, the California National Guard dispatched a drone to aid firefighters battling a massive blaze near Yosemite, helping spot hotspots from above. The non-profit Conservation Drones organization shares best practices for building low-cost drones for use in conservation-related activities, which include assessing water sources, tracking poachers, and monitoring wildlife in difficult terrain. The group's work can also educate the public on pressing conservation issues, such as deforestation in the jungles of Indonesia. Speaking of boldly going to hard-to-reach locales, drones can also help get supplies, medicine, and other assistance to both remote places and disaster sites. Matternet, for example, is developing low-cost, low-energy drones to not only bring medicine but also shuttle blood tests to regional health facilities for areas that are unreachable. Nearly 1 billion people do not have year-round access to roads, and in sub-Saharan Africa, 85 percent of roads are inaccessible during the rainy season. Drone Adventures, meanwhile, operate "drone missions" in conjunction with relief organizations to provide a visual assessment of areas devastated by typhoons, such as in the Philippines, or after the earthquake and subsequent nuclear reactor meltdown in Fukushima, Japan. Drone Adventures provided high-resolution maps of still-abandoned zones, helping to assess cleanup and reconstruction efforts. This story, "What drones can do for you" was originally published by TechHive.